With the promise of extra-bright lights in the big city, the Monster High ghouls are heading to Boo York City in their first musical, Monster High Boo York, Boo York! There, they hope to witness the historic passing of the Crystal Comet at a hair-raising gala and monster skull-ebration. Turns out the stage isn’t the only place for drama -- things get catty between Nefera de Nile and Catty Noir doll. The two (sold separately) battle it out in to-die-for comet-inspired gala outfits with metallic materials and faceted sculpting detail. Catty Noir, daughter of the Werecats, is the cat’s meow in a purple and silver dress with graphic pattern, dramatic silvery shoulders and a silvery bodice treatment. Bright blue shoes, a cat’s ear-decorated headband, silvery necklace and pink fingerless gloves are purr-fect. Plus, a matching handbag is out of this world! Use the doll stand and doll hairbrush to style the superstar monster for play or display. For a full cast of ghoulish characters, collect all of the Monster High Boo York dolls (sold separately)! 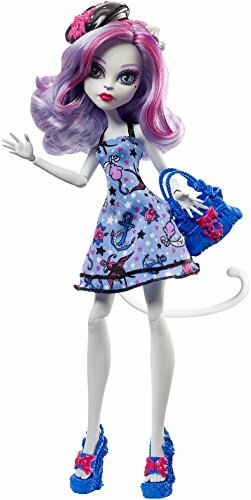 Includes Catty Noir doll wearing fashion and fashion accessories, one handbag, a doll stand and doll hairbrush. Doll cannot stand alone. Colors and decorations may vary. A new Scare Mester is starting at Monster High - and that means new lessons to learn, new looks to die - or undie - for and new beast friends haunting the halls! Catty Noir, a super-monster star, has decided to enroll and is outfitted in her fashionably fierce core school outfit. In her signature pink and silver, she's ready to rock a sleek silvery top with pink print and pink shimmery leggings. A black crisscross belt and pink collar are the cat's me-owww. Killer accessories include a pink Skullette school bag and to-die-for matching platform shoes. With her extra-long pink hair, she looks scary cool for the first day of school! Catty Noir doll also comes with a matching folder, signature-style brush, doll stand and character-specific diary. Collect the rest of the Monster High student body (each sold separately) for a full monster roster! Doll cannot stand alone. Ages 6 and older. Catty Noir may be the biggest pop star to ever attend Monster High, but she still gets the occasional case of Stage Fright by Mega Bloks Monster High. Catty is about to hit the stage, and she wants everything to go purr-fectly! Build the stage and set the scene for a larger than un-life concert when you stand Catty behind the bat-wing curtains. Swing open the curtains and spin the stage around to help Catty make a heart-stopping entrance. Then, start the show in freaky fab style when you press down on the microphone to play real Monster High songs! Ideal for ages 6 and up. 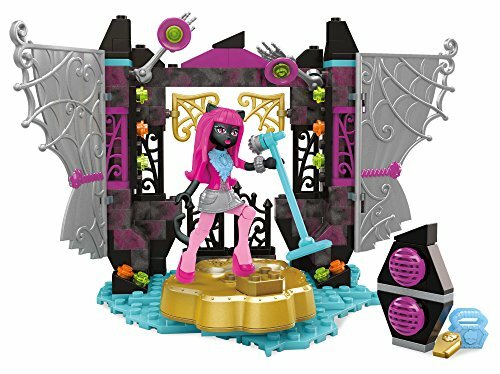 Help your child create their own freaky and fabulous world by gifting them this Monster High Glam Ghoul Band Mega Bloks set. 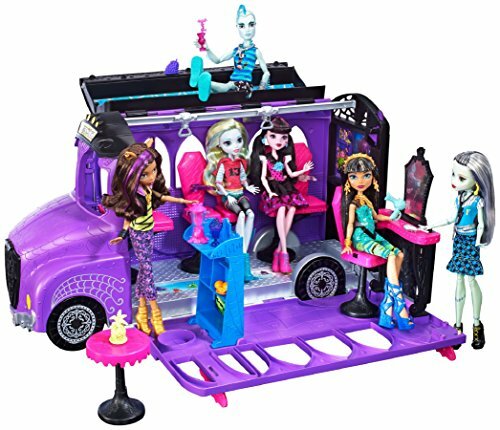 With it, your child can take all of their favorite girls from Monster High and set up a fun band scene. There are 8 characters included, along with 2 guitars, a drum set, a keyboard, 2 microphones, 2 speakers, and a candelabra. 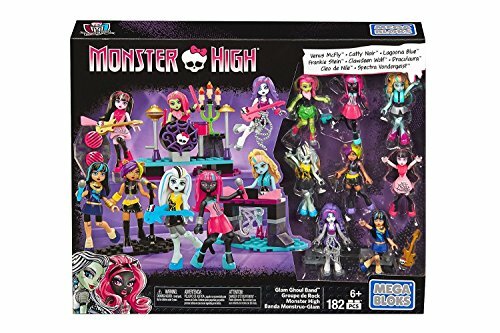 Combine this set with any of the other Monster High Mega Bloks playsets to make a full Monster High reconstructable world. Designed for children ages 6 and up. This Monster High doll is an absolute treasure! In the new Monster High adventure Shriek Wrecked, the ghouls make waves on the high seas. Celebrating nautical themes, the Monster High dolls look positively swashbuckling in outfits inspired by their monster legacies and seafaring style. Clawdeen Wolf doll, daughter of a werewolf, is furrific in a purple striped shirt and black Capri pants. A pirate’s headband, pink sash-style belt and purple boots with a pirate twist make fierce accessories, and a pink tote is claw some. Recreate sea-sational action and tell your own pirate tales. Collect all of the Shriek Wrecked dolls and accessories for a full crew (each sold separately, subject to availability). 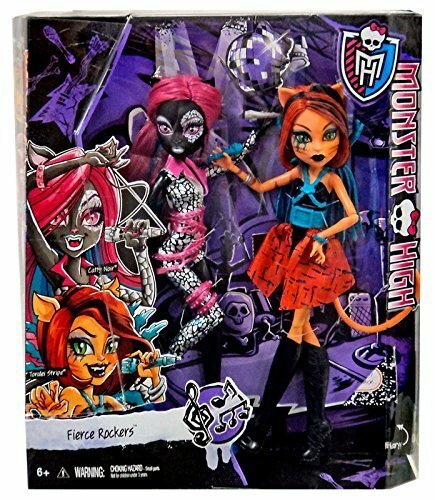 Includes Clawdeen Wolf doll wearing fashions and accessories, plus bag. Doll cannot stand alone. Colors and decorations may vary.